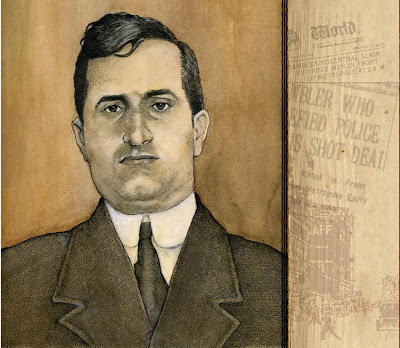 Today marks the 100th year anniversary of the murder of Herman Rosenthal. Much like one hundred years ago, New York City and rest of the east coast has been enduring some punishing heat these last couple of weeks. But back in July of 1912, a different kind of heat was boiling just under the surface as Rosenthal’s last days were counting down. He was desperate and despondent, narrowly escaping one murder attempt already and constantly looking over his shoulder. His gambling business was in ruins and he pointed the finger at only one man, Lieutenant Charles Becker of the NYPD. Rosenthal’s story and murder represented a tectonic shift in the Jewish underworld, shutting the door on the old ways of business and opening the next. Below is part of that story, some of which has appeared here before, while somewhat lengthy for a blog post, felt strongly it should be revisited again on its 100th year. Herman Rosenthal had a hard time getting anyone in New York City’s municipal administration to hear him out. Newspapers had been following his story while he filed complaints with the city’s various departments, but reporters weren’t getting any real results from him and relegated Rosenthal to the back pages. These were serious allegations, without any corroboration; it was one small time gambler’s word against a police department whose corruptible habits had a long history and was in itself not a breakout story. Rosenthal’s initial claims and complaints were broad and vague. With no willing witnesses to come forward and back him up, Rosenthal was alone, having a hard time selling his story. It was a young reporter for Joseph Pulitizer’s The New York World, Herbert Bayard Swope, who finally heard him out after constant prodding from Rosenthal. Swope had his ear to the ground and knew Rosenthal from frequenting East Side gambling parlors himself, and had a better understanding the underworld gambling world than most journalists in the city and his star was quickly rising. He was the best man at Arnold Rothstein’s wedding and maintained curiously balanced life of swimming between street level and high society social circles. He apparently brought Arnold Rothstein to a party in Long Island and introduced him to F. Scott Fitzgerald, who was hosting the party. Rothstein made enough of impression that Fitzgerald made mental notes and transformed the underworld kingpin in his Meyer Wolfscheim character in The Great Gatsby. On Friday July 12, Rosenthal spilled an affidavit to Swope in full color, not holding back on details, and named Charles Becker as his silent partner. Swope also helped arrange a meeting with Manhattan District Attorney Charles Whitman on the following Monday, after Rosenthal’s own earlier attempts had failed. Word reached Becker quickly through his many municipal moles about Whitman’s interest in finally hearing Rosenthal’s case, and it set off alarm bells. Newspapers stories were one thing, as slander and libel was manageable, and he was already preparing to come to his own defense. Whitman was another matter entirely. He was an ambitious Republican with an eye on the Governor’s chair in Albany and a strong distaste for Tammany Hall. The results could be very damaging to everyone and Becker knew Rosenthal needed to be silenced without further delay. Swope’s breaking story headlined the Sunday, July 14, 1912 edition of the New York World as a two-page spread. It not only detailed Becker’s involvement, but also the NYPD’s long history of graft and corruption. Already in the middle of a brutal heat wave, the city heated up figuratively as well, buzzing with this scandalous story that hit the papers on that summer morning. The underworld meanwhile got hotter under the collar, and everyone agreed; Herman Rosenthal was a dead man. On the evening of July 15, Rosenthal was sitting in D.A. Charles Whitman’s office, legally delivering his affidavit detailing all the aspects he had covered with Herbert Bayard Swope. After the very lengthy meeting ended around midnight, Whitman, fearing Rosenthal was probably a marked man, warned him to go straight home afterwards, but Rosenthal callously shrugged off the suggestion. He strolled down to the Metropole Café and Hotel on 43rd Street below Broadway; a favorite late night haunt for gamblers in the Tenderloin whose convenient twenty four hour business schedule appealed to many of the districts’ night owls. Even though it was late in the evening, the heat wave was still burning away, and Herman was in need of a celebratory late night meal. The Metropole was quiet, with just a few customers milling about, and no one seemed able to look Herman in the eye when he strolled in. In fact, all of 43rd Street below Broadway and 6th Avenue seemed eerily somber. With a bellyful of steak, Herman cooled himself with a Horse’s Neck, consisting of ginger ale with a twist of lemon, and spread out the late editions in front of him. Every newspaper in town had now picked up yesterday’s breaking story, his name in tall black and white headlines on every front page. Patrons in the Metropole ignored Herman’s smug, prideful boastings of his newfound fame, and kept to themselves. Bridgey Webber dropped by around 1:30AM and the two exchanged a few innocuous words, perhaps to put Rosenthal at ease, before Webber turned on his heel and left again. Twenty minutes later, a man never properly identified, approached Rosenthal to tell him that someone was waiting for him outside and if he could come out for a few minutes. Rosenthal gathered his newspapers under one arm, adjusted his tie and left a hefty tip for his dinner on the table. ‘Finally’ perhaps thought Herman, they had come to their senses and it was time for a payoff. Heading out into the hot night air, Herman’s messenger disappeared quickly to the left ahead of him as he made his way through the lobby and down the steps of the café. The approaching sound of clicking and shuffling shoes against the hot pavement came from his right, as four shadowy figures silhouetted by streetlight, called out his name and quickly approached. It was the last thing he ever saw. Rosenthal hit the pavement face down in a macabre moment of choreography as newspapers with headlines baring his name strewn all around to drive the point home. Four bullets, one to the chest, three to his head, had put an end to the life of Herman Rosenthal. Rosenthal’s murder led to many aftershocks that reverberated and rippled for a long time. New York’s layers of corruption were peeled away like a rotted onion. Here was a man whose public accusations of the police department left him dead on the sidewalk less than thirty-six hours later. It was hard not to believe members of NYPD’s finest were involved, and the killing went beyond a mere gambler’s quarrel as initially reported. While the murder took place in a very busy part of town, there were no solid witnesses, and confusion on details abounded. The initial police investigation was a bungled up affair, with witnesses intentionally disregarded and misleading information on the license plate number of the Gray Packard that carried the gunmen. Charles Whitman believed he knew deep down who was behind the murder and the obvious cover up, and speed was the key in gathering sources and witnesses. His suspicions were strengthened when Becker arrived at the 16th precinct a few hours after the incident to view Rosenthal’s body. Whitman was determined to bring the entire matter to justice and through quick vigorous investigating from him and his staff he succeeded. It was the kind of case that made a man’s career, and would help propel him to Governor. Information on the correct license plate number of NY43313, was the first break, leading to the car’s actual owner, Louis Libby. In less than 24 hours since the murder, Libby, driver Willie Shapiro, and Bridgey Webber were in custody, and the chips fell steadily in place from there. Bald Jack Rose eventually gave himself up as well; momentum on the case against Becker was building quickly and his name was in the papers too often. Becker’s biggest mistake was his trust in his underworld associates, and his years of experience swimming in the dirty water of this social pool should have provided him with better judgment. The rats abandoned ship. Rose, Webber and Harry Vallon all flipped to save their skins when it was clear Becker wasn’t lifting a finger to help them out. Becker himself was sitting in the Tombs by the end July. Fearing for their lives, all three men requested to be transferred to another jail uptown after Becker’s arrival. Building on the momentum created by all the press attention the case was getting, Whitman cunningly fast-tracked it into session. On the eve of Becker’s first trial to begin on October 6, he found himself short one winning card of a full house after Big Jack Zelig was murdered. Rose, Webber, and Vallon could not serve as key witnesses as there were also accessories to the crime, and it was with a man named Sam Schepps that he was dealt his winning hand. Schepps was a gambling associate of the three men and apparently party to Becker when arrangements for Rosenthal’s murder first took place. He however did not participate in anyway, giving him corroborator status for Whitman’s prosecution. Schepps had left town after the murder but was picked up in Hot Springs, Arkansas and brought back to New York for the trial. Becker should have been a little wearier of his presence at the time of the assassination arrangements but truly thought he was untouchable, never entertaining the idea he would actually be arrested for the crime. As sordid details from the separate trials for Becker and the four gunmen came forth, press coverage was un-precedented for its time. The rest of the country was transfixed by its daily developments, re-affirming its theory that New York was indeed a wicked place where values and moral standards had been over-shadowed by corruption and greed. Papers as far as London and Paris reported with morbid fascination as well. The New York Jewish community was going through a moral crisis as well while the trials continued. It had come to the attention of its leaders that the entire affair had become a very Jewish one. Of all the men involved in the case, it seemed only Becker and gunman Dago Frank was not Jewish. The names and photos of Horowitzs, Rosenbergs, Shapiros, Rosenthals, Rosensweigs, and other Jewish surnames were mentioned daily in the papers; quick-witted journalists aptly describing it as ‘The War Of The Roses’. The community looked inwards wondering where it had gone wrong. Uptown Jews felt the need to take action into their own hands on dealing with the growing downtown problem, and a communal body called The Kehillah was set up as a Bureau of Social Morals to investigate its own. They employed undercover investigators to infiltrate and identify Jewish criminals and places, sending lists of perpetrators and suspects to the Mayor and the police department, leading to numerous raids and arrests. The Kehillah’s main investigator was Abe Shoenfeld, who probed all manners of Jewish criminal activity, and was personally impacted the most by the state of prostitution carried out by many young Jewish women, and in the dangerous conditions and unhealthy lifestyles they lived. Though with all of The Kehillah’s intentions well placed, and with a respectable amount of results on a street level, the underworld, though turned on its axis as a result of the trials, remained one of transgress. No one saw the future more clearly after Rosenthal’s death than Arnold Rothstein, inventing the floating casino in the aftermath. By moving a gambling operation into different rooms and venues all over the city, it was an almost surefire method that raids could never be carried out if an operation was never in same location more than once. With little fanfare, they buried Herman Rosenthal in Brooklyn’s Washington Cemetery. What Rosenthal yearned in life, he only got in death. He sought recognition and succeeded only by default by being murdered; the result unveiling a side of New York City that had long been hidden from public view. He unknowingly challenged his own Jewish community as well, to question what was happening in their own neighborhoods and to their sons and daughters. He forced an underworld to change strategies on many levels in order to continue, and in-turn, a new era was born which would eventually flourish in a more organized manner. Herman Rosenthal should have been a minor, supporting player in the annals of early Jewish crime. And had his life not taken its fateful route, the city’s early 20th century history would have perhaps been documented very differently.